Many of you may already know the story of Rudolf Hess, Hitler’s right-hand man, and how he flew off to England to make peace with the British. His plane, of course, crashed in Scotland and he was made a prisoner of the Allies. Hess was immediately locked up and kept in solitary confinement nearly the rest of his life. What truths about the war did Rudolf Hess possess that were of such danger to the Allies? As for me, I worked as a male nurse caring for Rudolf Hess from August 1, 1982 until his murder on August 17, 1987 at the Allied Military Prison in Spandau. On the day of Mr. Hess’s death, I commenced my duties, which involved caring for my patient, as usual, at 6:45 a.m. I assisted him with showering and dressing, and was present when he ate a meal at 10:30 a.m. At no time did he give any indication that his state of mind was disturbed or that he was unduly de- pressed. Shortly after the meal, he asked me to go to the nearby town of Spandau to purchase a ceramic pot to replace one that was broken. Mr. Hess would not have made such a request merely to ensure my absence, since I was always absent in any event from midday, during my lunch break. At 2 p.m. I was called to the prison from my flat, which was located outside—but in the immediate vicinity—of Spandau Prison. After some delay I reached the summerhouse in the prison garden where I was told that there had been “an incident.” The small door at the front of the summerhouse was closed. When I entered the summerhouse, the scene was like a wrestling match had taken place; the entire place was in confusion. The straw tiled mat that covered the floor was in disarray, although only the day before I had cleaned the floor and had left the straw mat carefully arranged in its usual place. A tall lamp had been knocked over, but I clearly remember that the cable attached to the lamp was still connected to the main socket. It was this lamp cable which the authorities later said Mr. Hess—frail, 93 years old and suffering from crippling arthritis—had used to hang himself. A round table and Mr. Hess’s armchair had also been overturned. In summary, none of the furniture or equipment was in its usual place, and there is no question in my mind but that a struggle had taken place in the summerhouse. The body of Mr. Hess was lying on the floor of the summerhouse, apparently lifeless. Near to his body stood two soldiers dressed in U.S. Army uniforms. I had never seen either soldier before. I also saw an American guard, whom I knew as Tony Jordan. There was no cable anywhere near the body of Mr. Hess; as I have said, the only cable was attached to the fallen lamp, which was still plugged into the wall. I immediately proceeded to examine Mr. Hess. I could not detect any respiration, pulse or heartbeat. I estimated that death had occurred 40 minutes earlier. During the five years in which I daily cared for Mr. Hess, I was able to obtain a clear and accurate impression of his physical capabilities. I do not consider, given his physical condition, that it would have been possible for Mr. Hess to have committed suicide by hanging himself, as was later published by the Allied powers. In my view, it is clear that he met his death by strangulation, at the hands of a third party. But when I voiced my objections, I was threatened with professional ruination—or worse. For years I kept silent. But now I have told the entire story of my time with my friend Rudolf Hess, a man of great vision, intelligence and compassion, in a new book called Rudolf Hess: His Betrayal and Murder. The Barnes Review is the only American publishing house gutsy enough to publish the book. Several mainstream publishers in Europe gave us the run-around, promising to publish the book and then backing out at the last minute. What is it that is so dangerous about this crime and this book that it scared off big publishing houses? You will have to determine that for yourself. I have also included many photos from my own files and also reproductions and English translations of dozens and dozens of Hess’s personal correspondence, most never before translated into the English language. I hope you like the book and appreciate the time, effort and expense The Barnes Review has gone to in order to bring it to you. I guarantee that every word inside is the complete truth in regard to what I know about what happened to Mr. Hess and what I learned about him as a man. Bonus: “The Inside Story of the Hess Flight” plus three fascinating appendices from the Hess archives of TBR. But for Rudolf Hess, deputy Fuehrer in the Third Reich, and the last National Socialist imprisoned at Spandau Prison in Berlin, most of his adult life was an event of historical significance—as much while he labored for the peaceful restoration of Germany’s rightful place among the leading nations of the world, as in the silence and suffering of his 40 years of solitary confinement, until his death in 1987, at age 92. Rudolf Hess was born at the end of the 19th century to Protestant German parents. Son of a merchant, he grew up in Alexandria, Egypt. 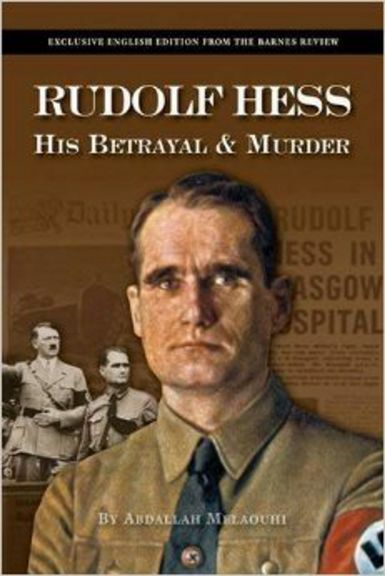 There, Hess learned fluent Arabic, in addition to his native German—a little-known fact, that one day would make possible the writing of Rudolf Hess: His Betrayal and Murder, by a Tunisian Muslim, Abdallah Melaouhi. Well acknowledged is Hess’s swift rise as a young man in the fledgling National Socialist German Workers Party (NSDAP) during the 1920s and ’30s. One of Adolf Hitler’s most loyal and unrepentant followers and admirers, Hess actually became deputy Fuehrer, known for his impassioned introductions of the Reich chancellor at NSDAP party congresses in Nuremberg and elsewhere. However, on May 10, 1941, all of that changed. Through a dangerous solo airplane flight to Great Britain, Hess sought to avert the impending world war, which would lead, in the end, to a nearly total triumph of socialism and communism in Europe. Nevertheless, as TBR readers well know, it was not Hitler who wanted war with the West, but the Judaeo-Freemasonic cabals, led by the Rothschild family of banksters, who sought to embroil nearly an entire planet in bloody carnage for their own personal enrichment. Neither did Hess want war. He approved of the efforts in Eastern Europe to reunite the German people into one country, but he remembered too well the horrors of the Great War and sought to prevent a more catastrophic repetition. Thus, Hess developed a daring plan to bring Hitler’s peace proposal to Britain, so that the Bolshevist threat could be attacked and destroyed swiftly, before it could consume all of Western civilization. Here the court historians fall—or dive—into the murk and slime. For 70 years, they have deepened the disinformational morass, until even those of good will doubted whether the truth could be found. Did Hitler know about Hess’s flight to Britain? Was Hess suffering from a delusional madness? Was the “peace plan” his own invention, or did the Fuehrer approve its details—perhaps even have a hand in shaping it? More significantly, why was it so important that Rudolf Hess, known and addressed only as the dehumanized “Prisoner No. 7,” should die in prison, rather than allowing the ailing nonagenarian a few weeks or months of freedom to be with his beloved wife, children and grandchildren, before passing from this world for ever? What was it that Hess knew, which was so “dangerous” that it required his death, presented as “suicide,” despite the physical impossibility of an arthritic old man hanging himself? Was the threat of a free Hess, who might tell the truth about National Socialism, so great? How did the “Allies,” those paragons of moral virtue, treat Hess during his 40 years of solitary confinement? What were the “state secrets” that led at least one of the four “Great Powers” to murder the last important living National Socialist? And who were the murderers? Why were they never brought to justice? Mr. Melaouhi’s outstanding book seeks the answers to these mysteries and is presented now by THE BARNES REVIEW, through great sacrifice, for the first time in English. For all that, Betrayal and Murder is not a political book. It is, rather, an intimate portrait of the last years of a man who spent more than half of his life in the custody of those for whom the destruction of Germany and the German people was the prime objective. It is also the story of his nurse, Abdallah Melaouhi, who selflessly cared for Hess during the last five years of his life. Mr. Melaouhi has woven a fascinating tale of the truth about one of the most maligned men of our time. This book is also a passionate plea by the author for justice. More than 25 years after Hess’s murder, the criminals are still at large. This appalling injustice—a crime in itself—is the motivating factor for the book’s appearance. Mr. Melaouhi felt bound in conscience to seek justice for the deceased and his family, even at the risk of his own life, nearly snuffed out by persons as mysterious as the murderers of Rudolf Hess. Betrayal and Murder is a book you must own and read, and then share with others. It is full of factual history you will find nearly nowhere else. From a contemporaneous account of Hess’s mission to Britain, to Rommel’s campaign in Tunisia, to the Melaouhi family’s lives as Tunisian freedom fighters, to the incredible tale of Hess’s survival through constant adversity, Mr. Melaouhi and TBR present compelling drama and pathos—all the more compelling because it is true. Here, indeed, you will “know the truth.” But with knowledge of the truth comes responsibility. If we do nothing about what we learn from Betrayal and Murder, don’t we then become complicit in the crimes it reveals? So buy this book, read it, and then act. Contact the governments of the four Allies and Germany, and demand justice for Hess.